Instead of selecting one book this week, I thought it would be fun to talk about an author. Okay, so Peter Brown isn’t only an author–he also illustrates. And not just any illustrator–the 2013 Caldecott Honor winner for Creepy Carrots! I first heard him speak at the 2012 SCBWI winter conference in New York City. I hadn’t read any of his books prior to that, and while he seemed like a nice (and kinda hip) guy, I can’t remember running out to get any of his books after the conference. Then, while browsing at our local library, I found The Curious Garden. I’ve been enjoying his brilliance every since. Here are a few of my favorites. The Curious Garden follows a young boy who discovers a pocket of bright green plants growing in his otherwise dull gray city. He cares for the plants, training himself in gardening. Under his attention, the garden expands, transforming the city. I suppose, it’s kind of a true story, in a way. NYC’s High Line Trail is an elevated railway converted into green walking space. Chicago’s Bloomingdale Trail is also being developed. So cool! All making The Curious Garden a poignant tale for showing what can happen with just a little bit of love. Mr. Tiger lives in a pseudo-Victorian world where all the animals are uptight. It’s no fun, so Mr. Tiger Goes Wild! The illustrations here are simply gorgeous–and they won Brown a Bull-Bransom Award, a yearly award for the best in children’s book illustration that focuses on nature and wildlife (given by the National Museum of Wildlife Art, in my hometown of Jackson, WY!). 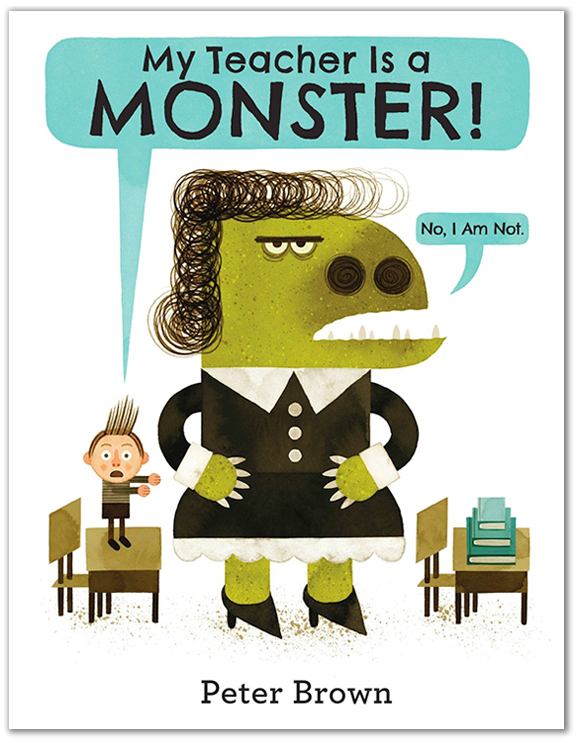 When my five-year old started kindergarten this fall, I got him Brown’s latest book, My Teacher Is A Monster! (No, I Am Not.) Bobby is convinced his teacher is a monster, and retreats to a park to unwind. But what happens when he runs into his monster of a teacher in the one place he can be free? Bobby learns that people can be quite surprising. Here’s a few of Brown’s other titles, but the list isn’t exhaustive. If you haven’t already enjoyed Peter Brow’s creative brilliance, do it now! This entry was posted in Book Reviews, Joanna, Picture Books and tagged book recommendations, Bull-Bransom Award, Caldecott Medal, Peter Brown. Bookmark the permalink. We have read Mr. Tiger Goes Wild, and we own Creepy Carrots. I didn’t realize these were all from the same author! Definitely some to add to our reading list.